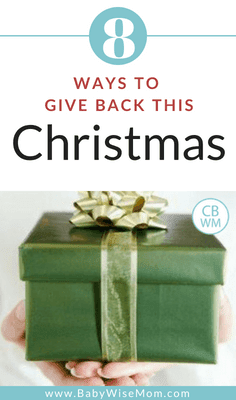 8 Ways to Give Back at Christmas. Focus on more than getting or even more than buying gifts for loved ones; find ways to spread the Christmas spirit to those in need around you. It seems most people are happy and even desirous to give to those less fortunate in any way at Christmas time. If your children are old enough at all to notice (and I would say older than 12 months is old enough to notice something is happening), it is a lot of fun to do something as a family to really give to others if possible. This is also fun with a child under one, but over one and they will at least wonder what is going on. I thought it would be great to compile a list of favorite charities and ideas for giving to others this season. I will share some things we have done and invite you to do the same. This can be a reference for all of us for ideas of what to do with our families to help keep our focus and our children’s focus at this time of year. One of our favorite things to do. Each year we choose a family to do the 12 days of Christmas for and we do it in secret. I guess it isn’t always a family; one year it was a widow. We then give gifts for 12 days. We choose families we think could use things. So for example, for a partridge in a pear tree we did pears. Three French hens we did three foods that have “French” in the name (French bread, French fries, French dressing, etc.). Six Geese a laying, eggs. Some are harder to come up with. For Nine ladies dancing for our widow friend, we did a crossword puzzle book because she loved doing crosswords. Our note then had a crossword we made that when filled in said “Nine Ladies Dancing.” For Drummers drumming, we did oatmeal and mixing spoons (so it was like a drum with drumsticks…get it?). This is a lot of fun and keeps you focussed on another family for 12 days. But that is a downside–you have to run this to someones house every night for 12 days which can get a bit crazy at Christmas time. Despite that downside, it is worth the sacrifice it takes. It is fun to hear about it through the grapevine as the family is always very excited for it. Each year, we also choose a family to do a simple gift for in secret. We choose a simple gift they can enjoy as a family. An idea is sugar cookie dough with cookie cutters. Maybe a book they can read together. My current favorite is to get a Gingerbread House kit and give it to them to make. We often do this one each year, also. This is another 12 days thing, but using a nativity set. We buy a nativity set. We then break it up into 12 deliveries. With each piece, we include a scripture to go with that item. This is great for helping our family and the receiving family focus on the meaning of the Christmas season. We do the stable the first night so they have somewhere to put all of the remaining pieces. Again, a downside to this is that you have to deliver an item each night for 12 days. Despite that, it is great for inviting the Christmas spirit. Last year, we got together with my husband’s parents and siblings and provided Christmas for a family in need. 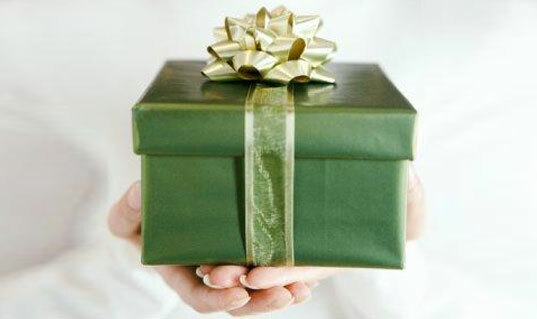 Each grandchild choose a child in the family to give a gift to. We also provided all of the food for a nice Christmas dinner. We delivered it Christmas Day. It was for a family who was struggling financially. It wasn’t extremely huge where it would completely replace a Christmas, but it helped lift their spirits during a difficult time. This is along the same lines as providing Christmas, but moving on to a much larger scale. This is organized through the United Way. Families volunteer to provide items for a family in need at Christmas. This is all about the children. You are asked to give two items of clothing, two toys, and a book for each child. You can also donate time and/or money to the organization. You can also do Toys For Tots if you want to donate toys but on a smaller scale. Which leads me to volunteering. Even if you are tight on money, you can still give to others at this Christmas season. Find a local charity and donate your time to do some volunteer work. Find one you can involve your children in. An alternate is to donate time to individuals who you know need it. Rake leaves for a neighbor or shovel snow. There are plenty of things to be done if you look for it. Maybe you are okay with money but short on time. I think most moms of newborns and even babies under one are quite short on time. As the kids get older, you can involve them more. But if you want to do something and just can’t get the time to do so, donate some money to a charity you trust. My friend Becca just shared this in our Babycenter group. I know many of you are familiar with it. Essentially, you pack a shoebox with gifts for a child. Go to Operation Christmas Child for more information. Hurry because drop of dates for this charity are coming up. Please share your ideas for serving others at Christmas time. What do you do? What charities do you support? I will move information into the main body of the post. Let’s all do our part to give back a little! my kids and I bake a variety of cookies and fudge and make several plates with each on them. Then we make cards to go with them and deliver a plate/card to each neighbor on our street. I started getting Caleb to help me bake cookies/desserts last year (he was 1.5) to give to the neighbors and his church teachers. He gets to hand the tin of goodies to everyone himself. We just put together our shoeboxes yesterday for Operation Christmas Child. I let him bring an empty shoebox to the store to fill up. This really helped him grasp the concept (now 2.5 yrs) better, especially since he won't personally see the child who receives his gift. I know this is really small, but one other thing Caleb does is bring a sheet of stickers to his church classroom to hand out to the other kids. I ask the teacher beforehand to be sure it's ok and she chooses the right time for handing them out (normally the end of class). It's a tiny gift in our eyes, but big for a 2 yr old and something Caleb can do completely on his own. He peels off each sticker and hands them out. He gets to see their smiles and has a smile plastered on his own face. He's learning to give and that's what's important! It's great that you are getting information out there for people to help others out around Christmas. It really does make a difference, no matter what you do. Operation Smile is a great organization that accepts holiday donations toward cleft palate surgeries for children. Becca, that is a really cute idea for church! I love it! We dropped off a shoebox today for Operation Christmas Child. I thought this was a great activity for my almost 3 year old. She did really well with putting toys she would have liked to play with herself into the box and was so proud to hand it over when we dropped it off today. Thanks for posting about it–we plan to do it next year too! So fun to hear Jennifer!